There is just something so yummy about an old fashioned baked beans recipe that works. It’s a simple recipe really. Just some dried beans, onions, something to make it a bit sweet and that’s it. Heat 10 cups of water and the beans to boiling in a Dutch oven. Boil uncovered for 2 minutes. Stir in the remaining ingredients except the 3 cups of water. Cover and bake for 4 hours, stirring occasionally. Stir in the 3 cups of water. Bake uncovered for 2 – 2 1/4 hours longer, stirring occasionally, until the beans are tender and desired consistency. You can easily make this into a healthier vegetarian baked beans recipe by leaving out the bacon, but I do have to admit the bacon adds LOADS of flavor. Even though this recipe is not exactly low calorie, making them from scratch instead of opening a can almost always ensures it’s healthier for you. YOU control what goes in and it’s preservative free. This recipe for baked beans does take a while to make from scratch using dried beans, but the result is so much better than the canned alternative that you will really want to give it a try when you have some time. There really isn’t all that much real work involved. Just soak the beans, put everything in the pot and let it bake. You just know that there isn’t much I make that takes that much prep time. I’m all for letting the oven do the work. 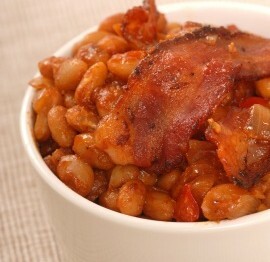 Baked beans are great to serve at a get together, especially a barbecue, buffet or picnic. Why are baked beans often referred to as Boston baked beans? It’ all about the molasses. The city of Boston was a real trading hub in colonial times and molasses was one of the top commodities traded. When the recipe includes molasses as a sweetener like this one does, it can be referred to as “Boston” bakes beans. 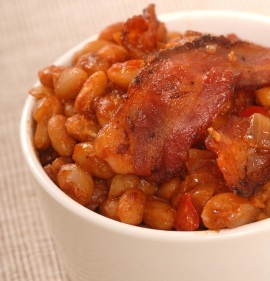 Looking to make baked beans for a barbecue or picnic? Browse our recipes for outdoor living here. If you like this recipe, please take a moment to Pin it to Pinterest, Tweet about it, Like it on Facebook and leave a comment below. Thanks a lot. I do appreciate it.